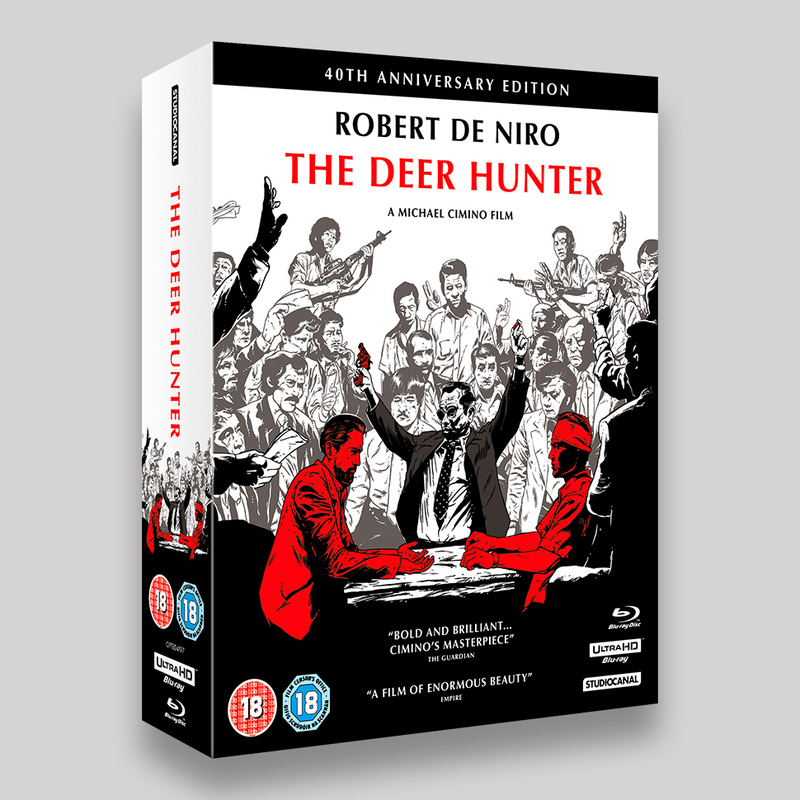 StudioCanal’s The Deer Hunter Collector’s Edition UHD and BD Packaging. 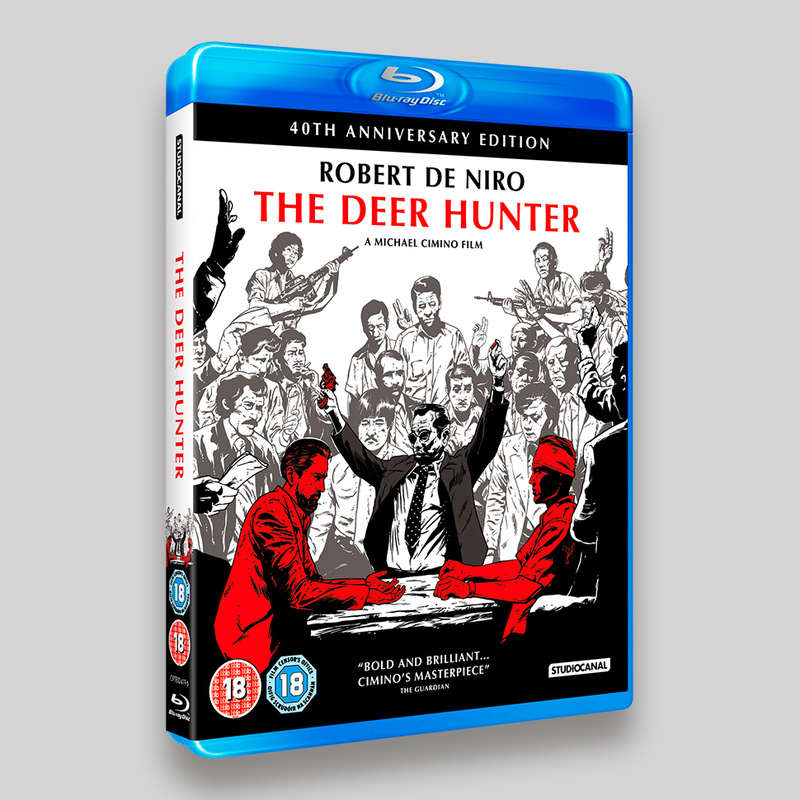 The artwork adapted the fantastic illustration from Johnny Dombrowski (see his other work for the Agatha Christie titles). 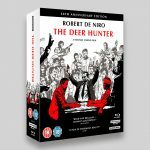 The stripped back nature of the artwork really captures the rawness of the film and the restricted use of red brings out the key elements. 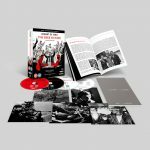 There are number of elements to the packaging including two booklet and an art card set as well as standard editions on Blu-ray and UHD Blu-ray. 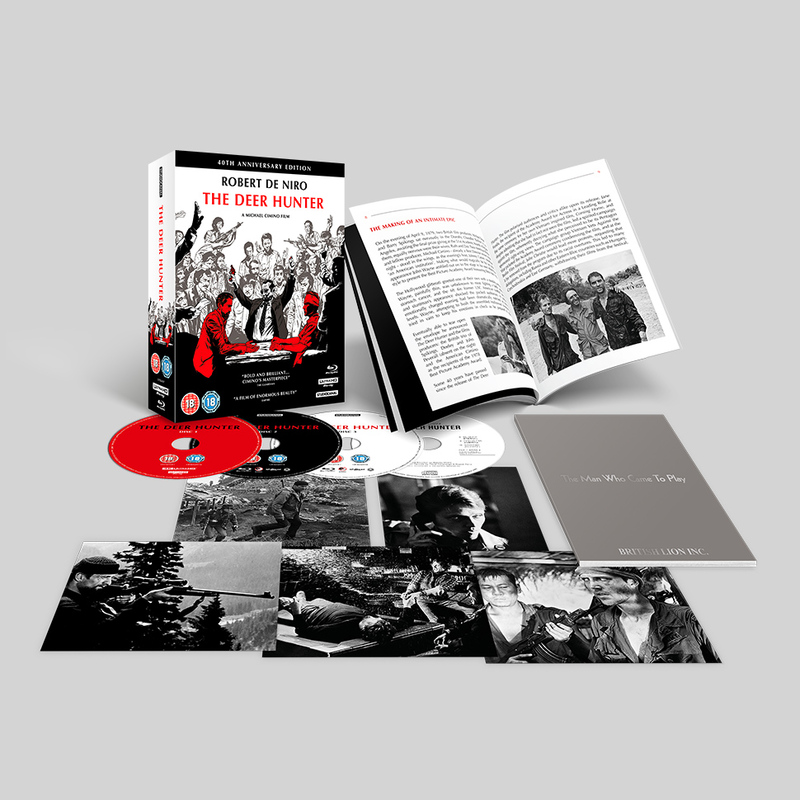 The first booklet contains the original script for ‘The Man Who Came To Play’ that the film is based on, the second is an in depth look at the film, featuring articles about the cast and crew, the making of as well as a number of theatrical elements and photos. 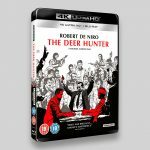 Michael Cimino’s masterpiece, The Deer Hunter has been stunningly restored to mark its 40th anniversary. 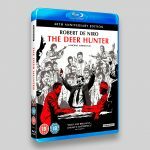 Winner of five Academy Awards including Best Picture, Best Director and Best Supporting Actor for Christopher Walken, The Deer Hunter is widely acknowledged as one of cinema’s great masterpieces and contains some of the most memorable scenes in film history. 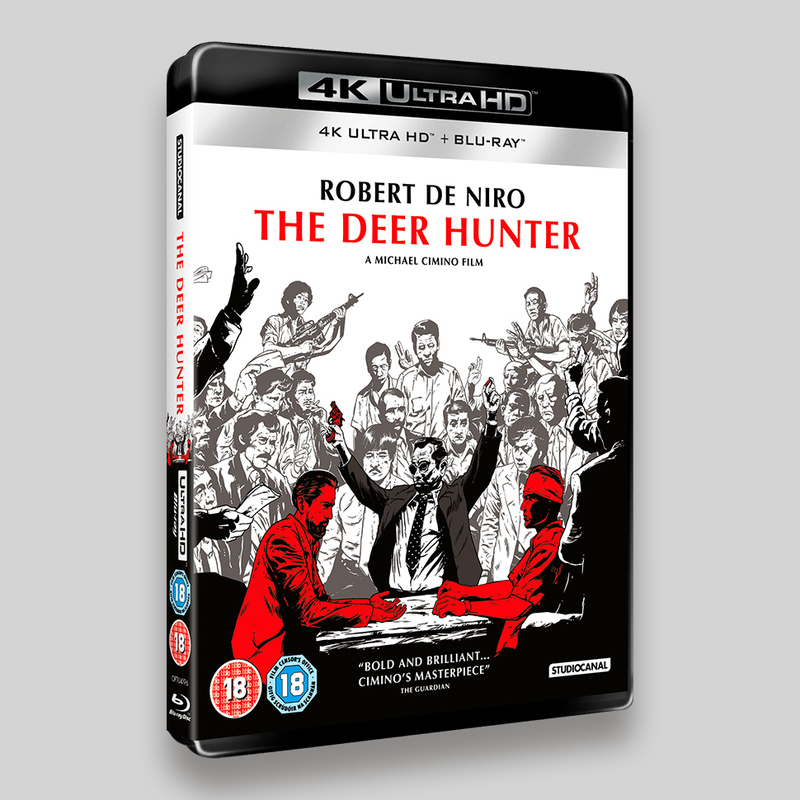 When Michael (Robert De Niro), Steven (John Savage) and Nick (Christopher Walken) are captured by the Vietcong, they are forced to play Russian Roulette by their brutal captors, who make bets on their survival. The experience of capture leaves them with terrible physical and psychological wounds, and when Michael returns to Saigon to fulfill an old promise to one of his friends, he makes an unexpected, horrific discovery. Also features astonishing performances from Meryl Streep as the woman both Michael and Nick fall in love with, and John Cazale (The Godfather, Dog Day Afternoon) as their unhinged and insecure friend Stan.